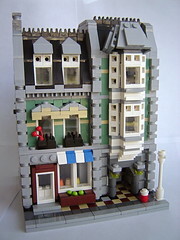 Brick Town Talk: The Street of Half-Size Sets Grows - LEGO Town, Architecture, Building Tips, Inspiration Ideas, and more! Remember the half-size Cafe Corner? How about the half-size Fire Brigade? What about the half-size Green Grocer?